24 August 2009, at 10:45a.m. US - Orka Food Technology Ltd (better known as EggTester.Com) announced today that it has released Version 3.00 of its market-leading egg quality testing equipment, EggAnalyzer™. The EggAnalyzer™ measures an egg’s weight, albumen height and yolk color, and automatically calculates the Haugh unit and USDA-grade in just 17 seconds (Patent Pending). 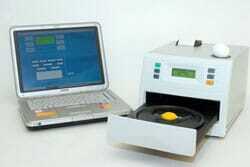 EggAnalyzer’s cutting-edge technology answers the need for consistent, accurate, and objective egg-quality testing. Prior to EggAnalyzer’s release in 2006, traditional testing methods provided subjective and, therefore, inconsistent results. Orka Food Technology (better known as EggTester.Com) is a leading worldwide supplier of egg-quality measuring equipment. The company was established in 2004 to respond to the needs of the egg industry for innovative, labor-saving, high-quality devices for measuring egg-quality. The professionals who founded EggTester.Com have backgrounds in multidisciplinary engineering, advanced medical devices, research, development and marketing. The flagship product, Egg Analyzer™ (patent pending), was released in early 2006 and was soon followed by a series of other egg-quality measuring devices, such as Eggshell Thickness Gauge and Egg Force Reader. Besides manufacturing state of the art egg-quality measuring equipment, Orka Food Technology is involved in ongoing research and development of other egg-quality measuring devices. The company sells internationally and maintains a network of distributors worldwide to assist with technical support and service.